A KOHLER automatic standby generator, available in 14kw and 20kw models, seamlessly backs up the circuits you choose or your entire house during a power outage. It automatically starts within seconds of detecting power loss, and runs on the home’s existing natural gas or LP fuel supply. 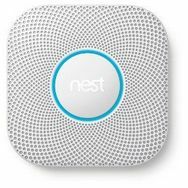 The smoke and CO (carbon monoxide) alarm that thinks, speaks, and alerts your phone. There's never been a smoke and carbon monoxide alarm quite like this. It has an industrial-grade smoke sensor, tests itself automatically, and lasts up to a decade. It's also the first home alarm you can hush from your phone without any extra hardware required. A Universal Electronic Upgrade for 40amp Mechanical Compressor Contactors. Prevent early failure and damage to your air conditioner or heat pump system. With a condensate pump, water is safely pumped outside the house or into any available drain, sink, or sump. Units have a built-in overflow safety switch and are designed for simple installation and quiet, trouble-free service. Completely self contained with stainless steel pump shaft, snap-action float switch, check valve with 3/8" hose connection and a 6 ft. power cord. This multipurpose water sensor can be mounted directly on HVAC units, in a metal or plastic secondary drain pan, on floors or even on a wall. The sensor continuously monitors any condensate overflow and automatically shuts off the HVAC unit and activates the alarm if any overflow is detected in as little as 1/16 inch of water. Solid-state, water-proof electronic sensor with no moving parts. Many homes have damp basements that are stale, musty, or smelly because of seasonal water issues, sump pits, floor drains or general lack of fresh air exchange. The XCHANGER Basement Fan is the economical and simple way to automatically ventilate your basement to eliminate basement odors and reduce humidity. If a dryer’s vent run is over 20 feet or the dryer is experiencing long drying time, your dryer may need a dryer booster fan. Dry your clothes faster and prevent lint build up with the new Dryer Duct Booster, and reduce the potential fire hazard associated with lint buildup! Includes a 5-Year no clog, no maintenance guarantee! Do you have one or two vents that you just don't get enough air out of? A booster fan can help! For round metal or flexible duct. Installed in ducts to boost air flow for hard to heat or cool rooms. May be wired in parallel with blower for simultaneous operation or with optional adjustable fan switch. Units are available in 5", 6", 7", 8" and 10" diameters. Heat Pumps should always be elevated above snowfall and to allow for proper drainage. Sturdy and stable, our 6" heat pump risers provide the desired elevation for heat pumps. Butyl mastic on the top and bottom guarantees no slipping and reduced vibration and noise. It's preventative maintenance for humidifiers. Chemical action holds lime and scale deposits in solution where they can be easily flushed away. Kills odor causing bacteria and maintains peak humidifier performance! Vial of 12 tablets. Order Your HVAC Accessories Today!